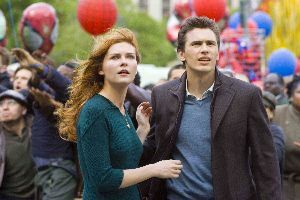 Cast: Tobey Maguire, Kirsten Dunst, James Franco, Thomas Haden Church, Topher Grace, Willem Dafoe, Rosemary Harris, JK Simmons, James Cromwell, Theresa Russell. Story: Spidey senses go all tingly again. It's the first of the summer blockbusters! And it's only spring! Are your spidey senses tingling? Well, if they are, you're the only one. Spidey himself seems to have forgotten he has them, as he spends the first ten minutes being battered by things he didn't see coming. However, it's not too long before they get too big to miss and boy, are there a lot of them. I spent much of the movie wondering when they were going to explain why these things all happened together, but no, we're supposed to believe it's all one big fat coincidence. An asteroid lands, conveniently at the exact place and time our hero happens to be, and on the same day that Green Goblin Jr decides to get nasty. The very next day big flaky baddie The Sandman is created and butter my balls if he doesn't have a hugely significant link to Spidey's past. In a planet of twenty people that would be a longshot. I know, I know, it's fantasy, it's not supposed to be real - it's just that the first two movies - particularly the first - didn't raise this flag; they were able to mix fantasy and reality without resorting to such a shoddy plot. It's hard to imagine how a plot can end up this poor when there are so many talented out-of-work writers in Hollywood. Fortunately the acting's better. Tobey Maguire suits the suit particularly well and Kirsten Dunst, although fudgey at times, remains pleasantly watchable. The two new baddies are the kind of actor that movie chiefs think we all know, but in reality you'll have to be pretty into your star-spotting to know them. Thomas Haden Church (The Sandman) was famous for five minutes during the Oscar buzz surrounding Sideways and Topher Grace is best known for a long stint in That 70s Show, which was popular Stateside but sank without a trace over here, largely due to being shite. Both actors are strong enough here to catch the eye, so they may become more familiar faces before too long. All this rambling and I haven't mentioned the special effects yet. Well, by and large they're excellent, especially The Sandman - a man made entirely from sand - who is created on-screen with pleasing panache. Throughout the remainder, there are only a couple of moments that don't look real, and considering there must be hundreds of CGI effects, that's a pretty good hit rate. 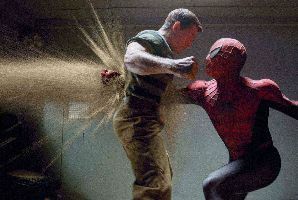 My only complaint is that the fight scenes are difficult to follow - they move so fast with such rapid camera movements that it's often impossible to tell which of the black-suited combatants has just been thrown through a wall. So is it good or bad? In truth, it's a bit of both, like the schizophrenic Spider-man himself. The comedy is terribly brash and obvious, but it still made me laugh, and there's enough action to keep most people interested. It's just not as good as its ancestors. Testosterone Satisfaction Rating: 2/5 - plenty of fast-paced action. To enjoy this film you should be: forgiving of the simian plot. Spider-Man 3 was released in the UK on 4th May 2007.